Iowa HSEM director Joyce Flinn and State Climatologist Justin Glisan. Key state officials say Iowans who aren’t in a flood zone today should prepare for flooding. 2018 was the second-wettest year on record and the ground is saturated — creating concerns as the snow in the Dakotas and Minnesota melts and drains south. “If we get into a regime with active precipitation patterns, we could be in a very bad position,” State Climatologist Justin Glisan says. Forecast models indicate there will be “above average precipitation” in the weeks ahead. The 147 years of weather records for Iowa show the atmosphere and surface temperatures are warming and that means it’s more likely to rain, according to Glisan. Glisan cites last summer’s flash flooding in central Iowa caused when as much as eight inches of rain fell in three hours. Joyce Flinn, director of Iowa Homeland Security and Emergency Management, says community leaders should consider how to protect key infrastructure, like drinking water plants, from flooding. Flood waters this week swamped three public drinking water systems in southwest Iowa. 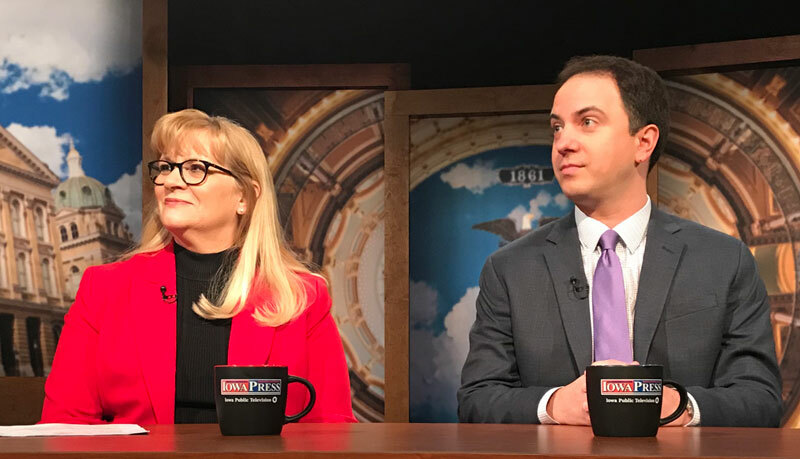 Flinn and Glisan made their comments late this morning during taping of the “Iowa Press” program that airs at 7:30 this evening on Iowa Public Television. This afternoon, Flinn is in a helicopter, flying over the flood zone in southwest Iowa with federal officials reviewing the state’s damage assessments.